The ICC World Twenty20 2016 is into the winter of it's life now with only one match, i.e., the big final, remaining. A lot of predictions were made before it's inception. The much anticipated favorites have already been kicked out. Some because of their own below par deeds while some because of the opponent team's above par deeds. Some expected performers rose up to every occasion while some of them retreated from every occasion. But all's said and done, every cricket fan now has eyes on two teams. Two finalists. England and West Indies. Both the teams have qualified for the final of the ICC World Twenty20 for the second time. England reached the finals in 2010 and defeated Australia by 7 wickets to win it's maiden ICC title. Eoin Morgan was at the non-striker end when his skipper Paul Collingwood hit the winning runs. Six years down the line, he himself is the skipper now and would be looking to continue England's winning streak in this tourney for atleast one more match. In the following season, West Indies qualified for the final against Sri Lanka in Sri Lanka. Darren Sammy and his men thumped the home team by 36 runs in Colombo. The core of that team along with it's captain remains same even after four years. As a result, they got the better of India in the Semi-final proving to the world that they have match-winners other than Chris Gayle as well. Out of the 13 times that both these team have faced each other in T20Is, West Indies have a healthy lead of 9-4. Sammy has represented the island nation in all the 13 T20Is. Out of the 3 times that both these teams have faced each other in World Twenty20, West Indies have an unassailable lead of 3-0 which means that England will have to turn the tables to win this final. 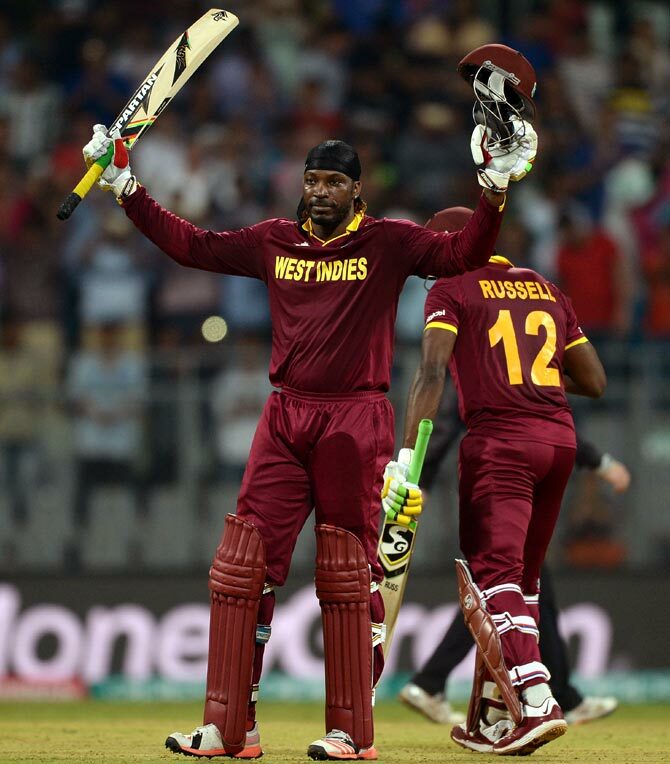 Chris Gayle tops the batting charts in all T20Is between West Indies and England (345 runs in 9 matches). His unbeaten 100 against England in Mumbai earlier in the tournament pushed them away from victory. But since then, his form has been little bit of a worry for West Indies (with all due respect to his potential). In the bowling department, Ravi Bopara led the table with 10 wickets in 8 matches. Among the current players, Dwayne Bravo has the most T20I wickets (9 wickets in 11 matches). The only sad thing about 'records' is that they are an act of past. Irrespective of how famous or important it is, past will always remain past. The prime objective for both the teams would be to live in the present and come good on the all important day. England have counted on their batting in the tournament so far. Neither are they expected to change even a bit of it. The 'J' factor has been really working for them. The likes of 'J'oe Root (195), 'J'ason Roy (183) and 'J'os Buttler (155) have been among the runs. Next on the list is Alex Hales with 65 runs in 4 matches which depicts that England have relied heavily on Root, Roy and Buttler. If Root lets the whole batting line-up revolve around him, Roy and Buttler have it them to attack any bowler in the world on any given day. Ben Stokes and Moeen Ali have come good with their all-round duties at crucial moments in the tournament. In the bowling segment, David Willey led the way with 7 wickets in 5 matches. Chris Jordan falls a step behing with 6 wickets in as many matches. However, Adil Rashid's economy rate of 9.13 and average of 34.25 has been a concern for Eoin Morgan and Trevor Bayliss. But Rashid's form is not the only concern for the team management. More than Rashid, it is perhaps Hales and Morgan's form which has kept the team management on it's toes. Hales has scored 65 runs in 4 matches at an average of 16.25. Whereas, Morgan has scored 61 runs in 5 matches at an average of 15.25. Both these numbers are comparatively low by not only T20I standards but their individual standards as well. 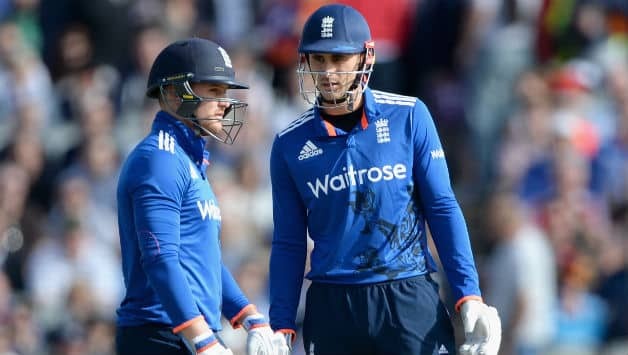 Regardless of what the other batsmen do, England need both their best batsmen of limited overs cricket to prosper in their respective roles. Hales will have to provide good company to Roy at the top of the order. More than anything, West Indies have relied on it's all-rounders throughout the tournament. For a team to play only two specialist bowlers (after Jerome Taylor was dropped) in such a vital tournament depicts a lot about it's trust in all-rounders. They bat as low as No. 9 and have 7-8 players who can roll their arm (if required). Such has been the impact of all-rounders for the team. Andre Fletcher's injury was more of a blessing in disguise for them. Lendl Simmons replaced him and was declared as Man of the Match in the Semi-final. Some one who was in Port of Spain 48-hours before the match conquered the Wankhede after scoring 82* off 51 balls. It was as if he was destined to travel around 14,000 km to win the Semi-final for his nation. In a match where every West Indian bowler went over 9 runs per over, Samuel Badree conceded 26 in his 4 overs including the wicket of Rohit Sharma. The 35-year old wrist spinner once again demonstrated as to why he has the lowest economy rate in T20Is. He may have only 7 wickets in 5 matches but his economy rate of 5.68 is what speaks for him. The other spinner, Suliemann Benn stands on the same page as well. If 2 wickets in 5 matches does not stand for his value in the team, an economy rate of 5.78 certainly does. Andre Russell, who opens the bowling for his team in the absence of a proper fast bowler is also their highest wicket-taker in the tournament so far (8 wickets in 5 matches). The likes of Dwayne Bravo, Carlos Brathwaite and Sammy himself fill in with the remaining overs. Who knows if Chris Gayle is handed the ball in front of Morgan, Stokes or Ali? The other hero from the Semi-final, Johnson Charles, is their highest run-scorer in the tournament (116 runs in 5 matches). The team definitely would want him to continue his good run. Chris Gayle will once again be the centre of attention for everyone. The English bowlers would be looking for immediate steps to dismiss him especially after what he did to them in their previous encounter in Mumbai. Marlon Samuels was declared the Man of the Match when West Indies won the World Twenty20 in 2012. Probably, the big match player in him would come out tomorrow. Having said that West Indies have all the firepower, lot of all-rounders and batsmen who can hit big, their key still will be in the hands of Samuel Badree. Not only because of his form but also after considering the fact that English batsmen are not so comfortable against leg spin. Badree, who bowls in the powerplay can be dangerous against Hales and Roy. And early wickets can dent the attacking approach of any batting line-up. For England, Joe Root will have to stand against all odds. He has been their best batsman in the past year across formats. The 25-year old can not only rotate the strike quickly but can also hit the big ones when required. If he can play an instrumental role for England chasing down 230 against the likes of Dale Steyn and co., he can undoubtedly chase or score against any bowling attack in the world. It will surely be a battle of nerves. England might not have defeated West Indies ever in World Twenty20. But still, there is no team tagged as 'favorites' going into the final. Both the teams have played and won one World Twenty20 final each. So, for either of them it would be a case of wining their second World Twenty20 final or loosing their first World Twenty20 final. The team which will stand on it's potential on the big day will lift the cup. IPL 9 Preview - Match 28 - GL vs KXIP. IPL 9 Review - Match 26 - DD vs KKR. Dhoni vs Raina: Second bout! IPL 9 Preview - Match 24 - MI vs KKR. IPL 9 Review - Match 13 - KXIP vs KKR. IPL 9 Preview - Match 13 - KXIP vs KKR. Elect to bowl, Elect to win! IPL 9 Preview - Match 8 - SRH vs KKR. The Chief vs The Lieutenant. IPL 9 Review - Match 2 - KKR vs DD. IPL 9 Preview - Gujarat Lions. IPL 9 Preview - Rising Pune Supergiants. IPL 9 Preview - Delhi Daredevils. IPL 9 Preview - Kolkata Knight Riders. IPL 9 Preview - Sunrisers Hyderabad. IPL 9 Preview - Royal Challengers Bangalore. IPL 9 Preview - Kings XI Punjab. IPL 9 Preview - Mumbai Indians.